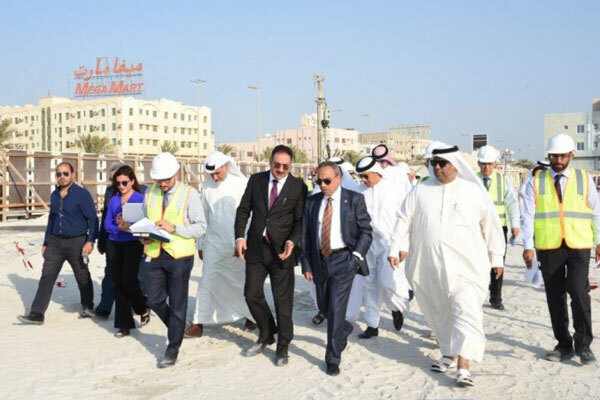 Khalaf along with senior officials at the Sadaa project site. Work is in full swing at Sa’ada, a premium waterfront project being developed by Bahrain Real Estate Investment Company (Edamah) in the Muharraq area of the kingdom, at an investment of BD45 million ($119 million). With the Phase One work fully completed in July, the project is on schedule for completion by the fourth quarter of 2019, said a statement from the Ministry of Works, Municipalities Affairs and Urban Planning. Phase one of the Sa’ada project will provide a dynamic, fully-accessible public waterfront with shaded terraces and parking, it stated. "There will be seven buildings for lease with a mix of food and beverage, kiosks, a multi-storey carpark and other supporting facilities including a chandlery to support the marina berths which are now in place," remarked Essam bin Abdulla Khalaf, Minister of Works, Municipalities Affairs and Urban Planning, after visiting the Sa’ada project site. The minister was accompanied by senior Edamah officials including Chairman Khalid Al Rumaihi and CEO Amin Al Arayedh besides Ahmed Jalal of Mohammed Jalal Contracting Company, the project’s main contractor and Engineer Asma Murad, the assistance undersecretary for Sanitary Engineering at the ministry. The early construction works including site reclamation and the setting up of the quay wall got completed in February. This came after the appointment of Gulf Engineering Company as the main consultant for the project and the appointment of AECOM as a consultant for the project infrastructure, said Khalaf. The infrastructure works will start this month following the land preparation and the building of the foundations – which were initiated last month, he added. Lauding the ministry for its support, Al Arrayedh said: "Projects like these are an important addition to Edamah's portfolio and a reflection of the government’s commitment to encouraging tourism developments that serve locals and tourists."